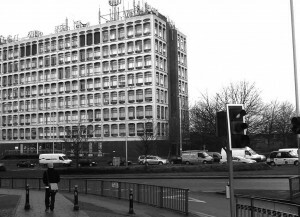 For those intrepid car traveler’s of today who use the Wolverhampton Ring Road, if on occasion you approach its busy junction with Stafford Street, and the lights are against you, as you sit and fidget, eyes on the lights, engine revving; well after today, relax, sit back and think on this. Whether you know it or not you are about to cross this mediaeval area once known as the ‘Four Ashes’ and the Ghosts of St Mary’s guard this entrance to the fast lane. The ‘Four Ashes’ was a small quiet area of Stafford Street, and is to be seen on Isaac Taylors map of 1750. (It is noted on my later 1950’s drawing as the area around the top of Charles Street). Now as we enter the nineteenth century with the arrival of the Canals and Railways, coupled with the influx of immigrants from Ireland, the environment in this area of town changed for the worst. We find St Mary’s Church (consecrated October 15th 1842), has been built to provide a little haven of peace amidst the turmoil around Stafford Street, which by now, fronted the mainly Irish quarter of town with its maze of courts and alleys around ‘Littles Lane’ and the canal, known as the ‘Notorious Carribee Islands’. Now if we fast forward now to the 1950’s we see a memorial to this historic spot in the form of a licensed house with the same title. The ‘Four Ashes’ was a William Butlers House, then in the capable hands of a widow; Francis Pearce. 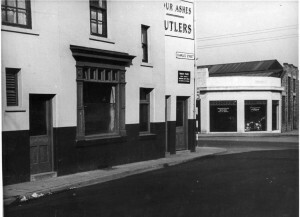 Here the pub is pictured at the top of Charles Street. 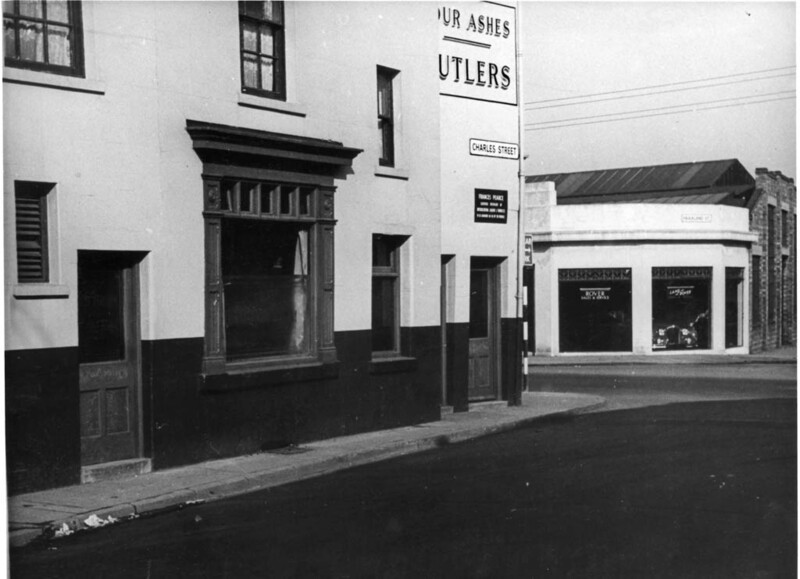 Across Stafford Street, directly opposite on the corner of Faulkland Crescent, was ‘Attwoods Garage’ (where Kwickfit is today). On the opposite corner of Charles Street to the pub stood ‘Brodies’ chemists, and Corkindales; a mens tailors. When this picture was taken, the Church of St Mary’s (on the left) was already redundant. 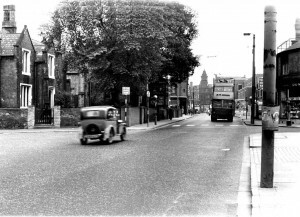 The remodeling of this area between Faulkand Street and Littles Lane began in the latter part of the 1940’s, with the closing of the Vicarage and Schools, and with the deconsecrating of the Church. The buildings themselves had a further 10 years of life, used as facilities for the Young Mens Christian Association. Littles Lane (on the far left) was not a quiet backwater, as it’s name suggests, it was a very busy carriageway which lead down to the Great Western Railway goods yard and Broad street canal basin, with many houses, pubs and works in the intersecting streets. 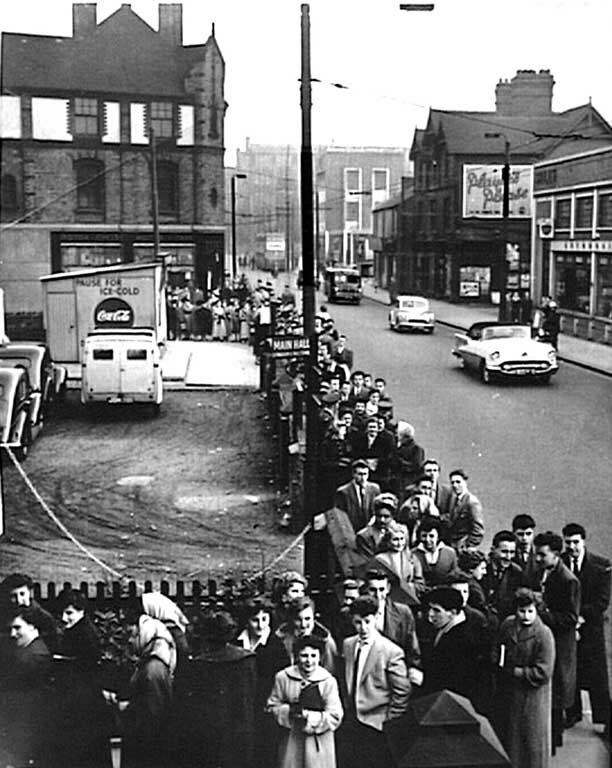 On the left, the towering block containing ‘Copes Motorcycle Dealers’, on the right across the road was ‘E.L Bouts Garage’, which would soon re-move to Merridale Lane. On the corner opposite ‘Copes’, was the former ‘St Mary’s School’, now being used as the Y.M.C.A. 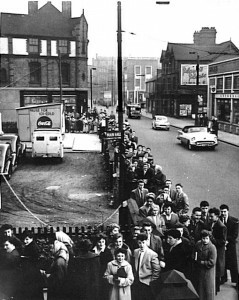 canteen, which was very busy with local trade and staff from the buses terminating at the top of ‘Stafford Street’. The Church building itself was partially demolished around 1950, a portion of the fabric was kept and adopted to form the new headquarters for Wolverhampton Y.M.C.A. Now re-structured it has taken on a new mantle, and re-named ‘The Percy Thomas Hall’ by its benefactor. For a few short years it would be a local dance hall, with its resident bandleader, Jack Andrews. It wasn’t always strictly ballroom at the Y.M., Jack wasn’t adverse to a bit of the new craze of Rock and Roll. 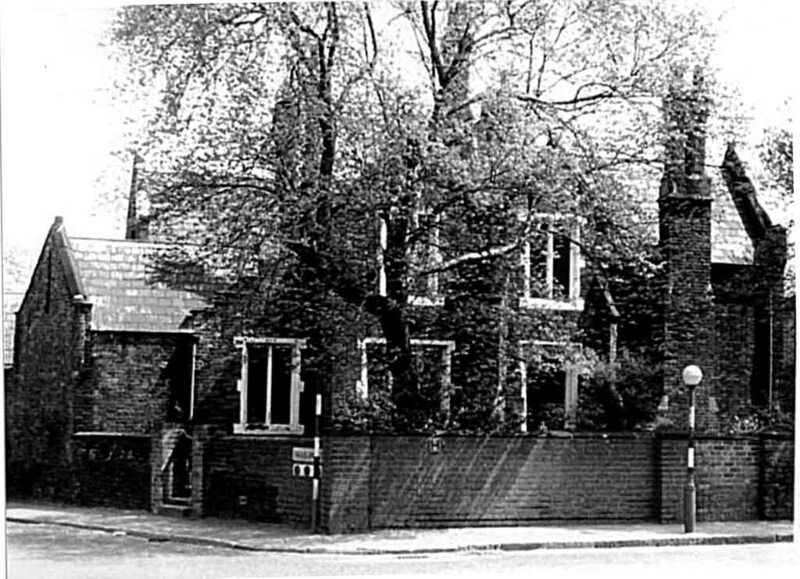 Next door, the vicarage was for awhile, a popular boys club, formerly the home of the ‘Toc H’. All types of youthful activities were enjoyed there. Apart from the film shows, there was snooker and table tennis facilities, on hand, and many crack players of both sports represented the Y.M. in the local leagues during the fifteen years following, before the buildings demise. A pile of rubble is all that remains today on tuesday 17th October 1950, of this once famous Stafford Street landmark consecrated in 1842 made redundant in 1949. What was it like in all its glory? 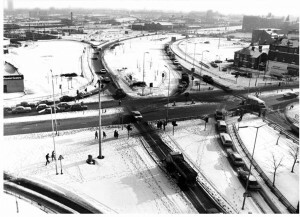 This Christmas scene was taken, from the top floor of Wolverhampton’s Faculty of Art Building, at the Stafford Street junction of the ring road in January 1982. The bells of St Mary’s had not been heard for over thirty years, and the drink had long run dry at the pub opposite when this treacherous carpet of snow brought to an end my minds journey of life around St Marys, but still the ghostly memories of the ‘Four Ashes’ linger on! i stumbled across this site whilst looking for images of wolverhampton, what i wouild like to know is, was there once a church at the junction of newhampton rd and waterloo rd? There was indeed a church about one hundred yards north of the junction of Newhampton road and Waterloo Road opposite Molineux Grounds. In the late 1950’s it was known as the Natural Spiritualist Church. thanks, i live in a flat at the junction of waterloo rd and newhampton rd,, when i look at some of the original wall,at the entrance to the car park,wich is oppsite bath rd,i couldnt help but wonder if a church was once on that site, also the building next door is called the old rectory. 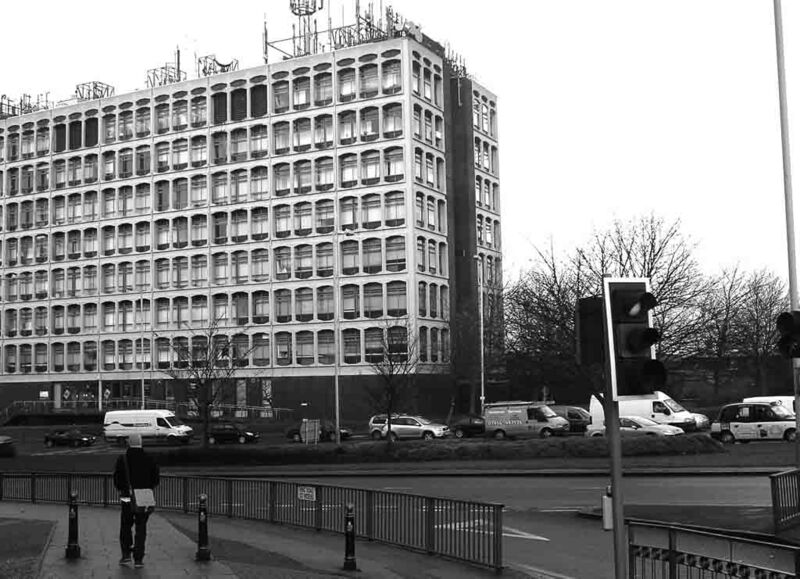 I have a strange feeling we have met at some time in the recent past , could it have been at the civic centre. 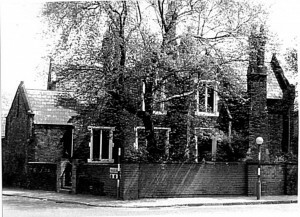 The building you mention on the site on the corner of Newhampton Road was indeed the old rectory, in fact it was the rectory to the Collegiate Church of St Peter’s. There was no actual church building on the site. I have copies of maps showing the area around the top of Newhampton Road, also early photographs of the rectory should you wish to see them put a request on the forum or on the Howl and I’ll post a little story. Jack Andrews was my grandfather – right up to his death, he still had all of the old vinyl records that he used to play and even some of the sheet music that the band used. When there was some sort of reception at the city hall, he even managed to fit into his original suit and tails from the big band days. If anyone remembers anything about him or the big band days, plesae get in touch. Thanks. I like many others are researching my family tree and met last week with a second cousin from Australia which was fantastic,and sharing info, she mentioned that one of our relatives had a dance band called the Jack Andrews Band, I also know he owned a shop but what kind and where no one can tell me, I notice that you mention a Jack Andrews in your blog, can you tell me about him and did he hail from a very large brood from Montrose Street ( what would then have been the Irish quarter near the Elephant and Castle that was, and of course, the emerald club…. Please get in touch, I am a distant cousin, Rosemary Andrews, grand daughter of Frank Andrews, one of Jack’s uncles, you can post on this site or on the Ancestry Message Boards for Andrews, Staffordshire. I am a great grand daughter of Emma Catherine Andrews, sister of Frank Andrerws and aunt of Jack Andrews. Emma died at the age of 28 years leaving my grandfather James Alexander aged 1 year who was brought up by aunt Annie with cousin Tom at Montrose Street. My mother Joyce remembered your grandfather Frank with fondness. I remember Aunt Annie,uncle Fred and cousin Tom. Like you i have met members of the Australian branch of the family. it would be of real interest to find out more about Jack Andrews. Sorry to take so long to reply, I don’t go on this web site very often. My dad was Fred Andrews too the same as your Great Grand Mothers youngest brother, Frederick Andrews born in 1898. I remember Tommy Dudley very well but not Olive who was your grandmother? 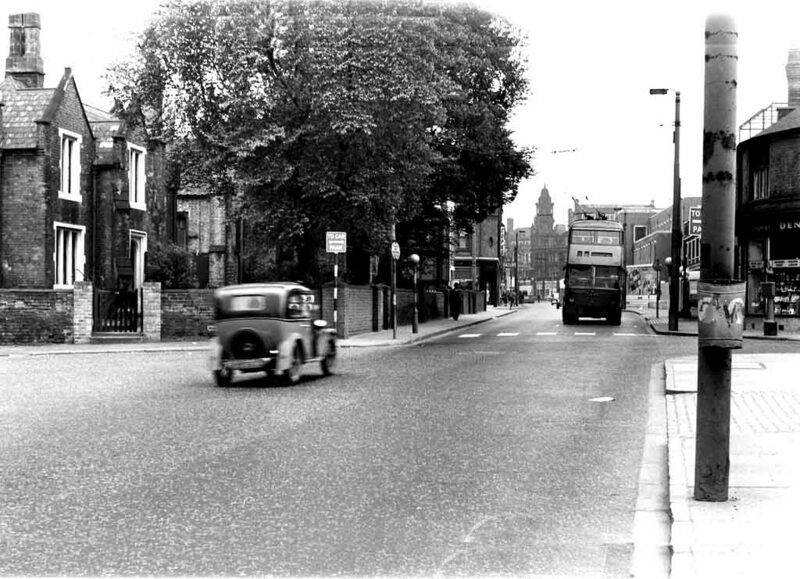 My sister, Angela, remembers going to your house on the Tettenhall Road with our dad Fred, he was close to your mum. I never went as I was very small then. The person to contact about Jack Andrews the band leader, is Debbie Orer, he is her grandfather, she goes by name of Turkish Debs on ancestry. Your brother Patrick is a doctor I believe?, though he is probably retired now. If I find out any more about Jack Andrews , I will let you know. I am doing the family tree so anything you can tell me about James and his father Charles would be most welcome. Do you still live in Albrighton? Look forward to hearing from you, I am on facebook under rosemary platt (nee Andrews) and on ancestry under the tree of Andrews-eggington. Years ago i lived in saint Marys Terrace which lay at the back of the ymca, number 3, can anyone relate to this?. I now live in Wales, but am homesick for Wolverhampton,yes still a wulfrunian.My question is “Why is St Marys Terrace never mentioned”Perhaps Billy could enlighten me on this. I have started a thread about St Mary’s Terrace on the forum June have a look, join the forum and keep posting. We moved to Saint Marys Terrace Number three in 1941. My mother married Joe Wright, who had four children by a previous marriage.It was a hovel,the water, and toilet was outside,a two up and two down,and there was even less room when our mum, and my brother, who is seven years older than me moved in. Our surname was Lambeth.What bothers me is this….this man you mentioned,Maiden, was the place made more habitable before he moved in in the fifties,and did he know it was haunted?.There were problems in the attic.Even at such an early age I sensed it, and there were witnesses.This is all good stuff, and you are a star. I just came across you site by chance after googling Stafford Street. 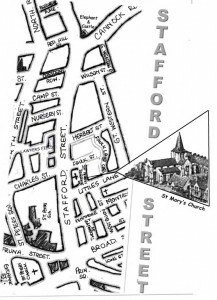 My great grandfather William Tonkinson lived at 48 and 49 Strafford St. He owned both properties and moved from one to the other. He was a grocer and this was also his business premises. I have an auction list from 28th October 1925 listing both the properties for sale by his executors. No48 was let to a Mr W A Bates (Millinery and haberdashery) and No49 to a Mr J Green. Do you by chance have any photos of this part of the street or any other info. I am sorry for the delay in getting back to you Jamie But I have just had a spell in hospital. Now the piece of Stafford Street you enquired about as with most scenes of that old thoroughfare are few and far between. This photo I will find and place it on our Facebook Group Lost Wolverhampton -Anything you don’t understand jamie get back to me on it. I have see Doug Lewis’s greta website on War Memorials in Wolverhampton, but are there any others around the city which are not so well documented? 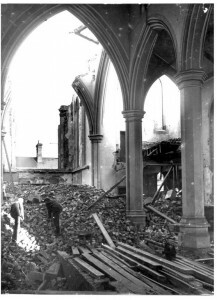 What happened to the one in the churches that were demolished or have had change of use like st Georges (Sainsbury’s) etc? Hello Claire So nice of you to get in touch. Its a subject I haven’t particularly dealt with we will have to have a chat the next time we meet up about the dozen fine churches that have been lost to this town in my lifetime.